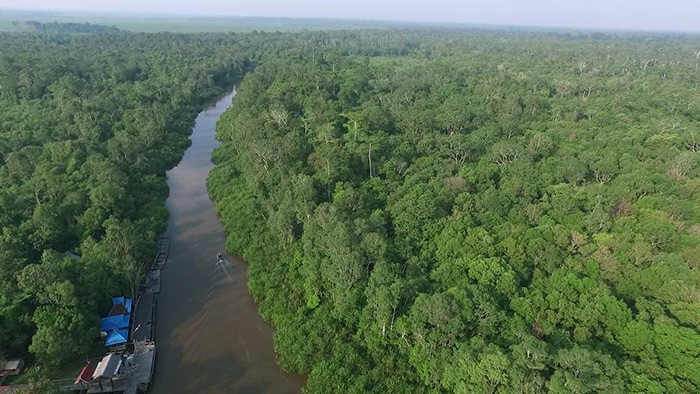 Tanjung Puting National Park is a national park located in Central Kalimantan peninsula, this is the largest orangutan conservation in the world with an estimated population of 30,000 to 40,000 orangutans are scattered in the National Park and also outside the National Park. In addition Tanjung Puting National Park is also designated a Biosphere Reserve in 1977 with a core area of Tanjung Puting National Park covering an area of 415,040 hectares were set in 1982. National Park status and Tanjung Puting National Park biosphere reserves can be maintained continuity and the appeal of tourism in Indonesia, in contrast with the other conservation of Borneo Orangutans part we see orangutans in man-made habitats. While in Tanjung Puting we can see directly the natural habitat of orangutans live their lives and see directly in the wild. Tanjung Puting is initially a nature reserve and wildlife reserves with a total area of 305,000 hectares. Access to visit Tanjung Puting National Park is by boat klotok which is fairly comfortable accommodations, Klotok are loading passengers 7 up to 12 people. The boat speed is not too fast, so that we can enjoy the atmosphere Sekonyer river along the road. With this boat, passengers can enjoy the sunset, fireflies and other wild animals are sometimes seen alongside the river. Most visitors that visiting Tanjung Puting National Park are foreign tourists, because of the many foreign tourists who come here to make people Pangkalan Bun and National Parks further improve their services. With guide services and boat captain were friendly. Along down Sekonyer river we can see monkeys swinging from one tree to another. These forests are home of eight species of primates. Including monkeys who has a long nose or bekantan (proboscis), with a long nose the local communities called Monyet Belanda (Netherlands monkeys) because of nose aquiline. When down Sekonyer river to the Tanjung Putting area please be careful by crocodiles, they are difficult to see but they exist around the river. One of the interesting places in Tanjung Puting is Camp Leakey, the orangutans preservation. Many camps here like Tanjung Harapan, Pondok Tanggui, Pondok Ambrung, and the last is Camp Leakey. This camp is the largest and was built in 1971. This place is a refuge location orangutans rescued from illegal hunting. Nowadays this camp is known as a center for the study of orangutans. We could learning orangutan at the information center of Camp Leakey. This camp will be maintained because the orangutan is an endangered species, threatened by the effects of deforestation and the illegal pet trade. In addition Pondok Tangui also a rehabilitation center for orangutan had been arrested. Both of preservation center, you will get a chance to see these amazing primates up close and learn more about how we can protect endangered species from Borneo Island.